Our custom doors are made with an aluminium frame and a choice of infills. These hand made doors provide an outstanding design element to your home. 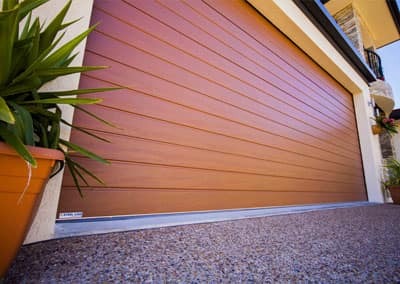 Make a bold impression with the attractive range of Quokka Garage Doors Colorbond® sectional garage doors. Enhance the exterior of your home with a garage door that will complement any style of architecture with a range of 6 garage door styles to suit the unique characteristics of your home. Easy to use and long lasting, our roller doors can be made to suit most size garage openings. Our range combines a unique profile with first class materials making them some of the strongest, quietest and most reliable garage doors available. DecoWood® Garage Doors offers you the balance between function and style for your home. They provide you with the strength and durability of steel, will the charming aesthetics of timber. Our insulated garage doors provide insulation from the heat and cold, and are made of first class materials to ensure maximum safety and a long service life. The insulated garage door is constructed with high strength BlueScope steel and ThermaDoor expanded polystyrene (EPS) laminated panels, finished with an impact resilient vinyl laminate. Quokka Garage Doors offers a range of timber garage doors, which can be matched to suit the look of your home. The most popular timber used in our timber garage doors is Western Red Cedar which looks equally beautiful on an old or a new home. In high wind and cyclonic areas, it’s sometimes necessary to engineer your garage or industrial door a little differently to ensure it withstands the particular stresses it may be subject to. Quokka’s cyclone garage doors are ideal for use in homes, sheds, commercial and industrial warehouses in high wind prone areas. Make a bold impression with one of Quokka Garage Doors classic colorbond sectional garage doors in either our Ranch or Heritage style.